The Five Tibetans consist of five very simple and highly energizing yoga-like poses that provide a great way to keep your body in shape when you have limited time for physical exercise. The exercises balances your nervous system and open up your airways and strengthen your breathing muscles. Doing these poses will take no more than 5 to 15 minutes of your time (depending on how many repetitions you do of each exercise), and you can do them wherever there is sufficient space. All that is required in order for you to perform these fast an effective poses is enough room to stretch your arms out while standing and enough floor space for your body while lying down. You may prefer to do the Five Tibetans on a carpet or a yoga mat to avoid the discomfort of a hard surface. The exercises are performed preferably in the morning or evening, but the key is to find a time and routine that fits your schedule and lifestyle. If you are not used to exercise, or haven’t tried any yoga exercises before, it is recommended that you start out slowly. Begin by performing three repetitions of each movement once a day for the first week. Add two repetitions per week (over about ten weeks) until you are up to 21 repetitions of each exercise. Twenty-one repetitions of each pose per day is sufficient, but if you want to do more you may do them both in the morning and the evening. You may also divide them up so that you do half the repetitions in the morning and the other half at night. Pay attention to what your body is telling you in the very beginning, and do not strain or force any movements that cause you pain. A little soreness is perfectly okay, but it is best to be kind to your body and start out gently so that you don’t have any physical discomfort the following day. There are two important aspects to consider in regards to breathing while doing the exercises. Do not hold your breath. When you hold your breath, especially after inhalation, your body becomes tense, which makes any kind of exercise more difficult and uncomfortable. Try to breathe as rhythmically as possible so that the air flows in and out in harmony with the exercises. Exhalation is connected to relaxation and strength. Exhalation is normally a passive process where the breathing muscles are inactive and your body relaxes. If you are not comfortable with the breathing instructions given with each exercise below you may want to inhale and exhale in the opposite order. Either way is just fine, so do what feels best for you. 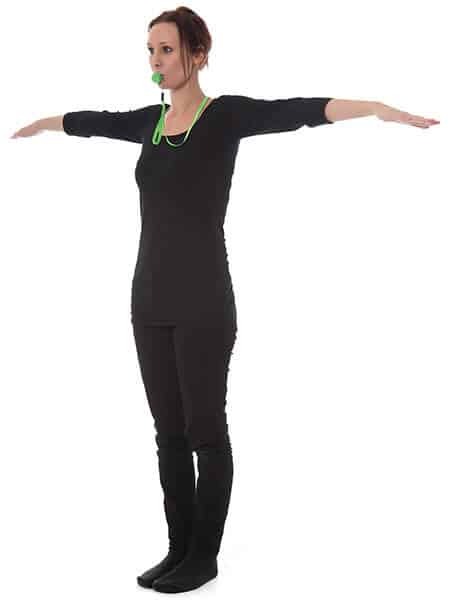 The Relaxator Breathing Retrainer can be used to great advantage during the exercises, as it facilitates a more rhythmic breathing that enhances the effects of the exercise poses. Tibetan #1. Stand up straight with your arms out at shoulder height. Keep your fingers together and turn your palms down. Spin around clockwise. Inhale through your nose and exhale through the Relaxator during the entire exercise. How fast you spin is not important. If you get dizzy, slow down and stop. This exercise strengthens your sense of balance, and over time you should be able to do it without becoming dizzy. Tibetan #2. In this exercise you will be exhaling as you raise your legs and head, and inhaling as you lower them. Lie on your back with your arms along your sides, palms facing down and legs together. Your shoulders and lower back should rest on the ground throughout the exercise (don’t arch your back). Take a breath in through your nose and exhale through the Relaxator as you lift your legs straight up as high as possible, while lifting your head at the same time, in one smooth motion. Hold this position for a moment or two while maintaining relaxed and regular breathing. Inhale through your nose as you return your legs and head to the starting position – lying flat on the ground with your legs fully extended. Try not to bend your knees when lifting or lowering your legs. Tibetan #3. Kneel with your legs together and place your palms on the back of your thighs, or on your bum, as a support. The bottoms of your toes should be on the ground, facing forward. Keep your back straight, and let your chin fall forward towards your chest. Take a breath in through your nose and then exhale through the Relaxator as you lean your upper body backwards. Let your head and neck fall back as much as you can without straining your neck muscles (don’t stretch your neck to the point of pain). Be sure to use your hands to support you as you lean back. Breathe in through your nose while you return to the starting position. Repeat the entire exercise in a steady rhythm – exhaling as you move your head and neck back, and inhaling as you return. Tibetan #4. Sit up straight with your legs stretched out in front of you, placing them so they are slightly less than shoulder width apart. Place your palms on the ground by your hips with your fingers turned forward. Tuck your chin towards your chest and inhale through your nose. Exhale through the Relaxator as you raise your buttocks off the ground, bending your knees, and keeping your feet flat and your arms straight. Continue to raise your buttocks until your trunk and thighs are parallel to the ground, like a table, and let your head fall back as far as is comfortable (avoid straining your neck). Inhale slowly through your nose as you return to starting position, sitting on the floor. Repeat this exercise in a steady rhythm. Exhale as you rise from the floor and inhale as you return to the sitting position. Your feet should remain in the same position throughout the exercise, so try not to let them slip. Further, try not to bend your arms during the exercise. The movement is performed with your arms straight so that the rotation takes place in your shoulders. Tibetan #5. Begin the exercise by supporting yourself on your hands and knees (as if you’re doing push-ups), with your hands and feet slightly less than shoulder width apart. Bend your head up and back, and come up on your toes, with your weight supported mostly by your arms. Exhale through the Relaxator as you lift your buttocks towards the ceiling, tucking your ears between your arms so that your body forms a perfect triangle, with only your hands and balls of your feet touching the ground. If you feel you can do it, try lowering your feet all the way down until they are flat. Inhale slowly through your nose while you return back to the starting position with your body stretched behind you and your head up and back. Aside from your palms and the balls of your feet, your body remains above the ground throughout the exercise, and your arms and legs remain straight. Repeat the entire exercise in a calm, steady rhythm. Exhale as you move your body upward by lifting your buttocks up high, and inhale as you return to the starting position. Once you have completed all five exercises, lie down on your back and relax for a few minutes. Allow your breathing to become calm and restful, paying attention to new sensations you may be experiencing in your body. You may also rest for a while in between the exercises, if you want to. The Five Tibetans are presented in the book, Ancient Secret of the Fountain of Youth, by Peter Kelder, published in 1939. You can order it on Amazon, where you will also see over 300 reviews of the book that are mostly very positive (4,4 out of 5). An edition from 1985 may also be downloaded via this link.